Our First Bark on the Ark in our Naples Location! In honor of National Dog Day on August 26, we are hosting our first Bark on the Ark cruise in our Naples location from 8:30 a.m. to 12:00 p.m. on Saturday, August 26. Guests will have the opportunity to bring their dogs aboard the M/V Edison Explorer for a sightseeing cruise to Keewaydin Island for playtime. 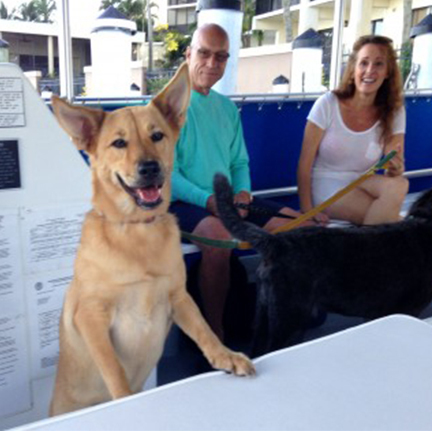 Passengers can enjoy a peaceful cruise followed by a playful time on the beach, socializing with man’s best friend. During the excursion, dogs and owners can run, swim and play catch while enjoying the sunshine, water, sand and fresh air. While Pure Florida cannot guarantee animal sightings in the wild, the captain will alert passengers to wildlife such as dolphins, eagles, manatee, native birds and more. Water, Frisbees and dog treats are included for the canines. Soda, wine and beer will also be available for purchase. The M/V Edison Explorer will depart for this special trip from Tin City Marina, located at 1200 Fifth Avenue South, Naples Florida. Registration for the tour is $44 per person. Groups of six or more can call for discounted group rates. Reservations are required as room is limited to 25 passengers and their pets. All dogs that can follow basic commands are welcome. For more information or to book your ticket, call 239-263-4949 or book online. Click Here To Reserve Your Pawsome Spot Today!